Are you a tofu eater? It’s ok if the answer is no. My answer used to be no until I learned how to use tofu. Tofu has been around for a long time, quite possible as far back as 950 AD, can you believe that? Tofu hit the American grocery stores in the late 1950’s. There are many kinds of tofu and choosing the right one makes all the difference in how well your dish turns out and if you will actually want to eat it. Most tofu is sold in block form in your grocery. Soft Tofu has a high water content and is best used in recipes like smoothies, desserts, puddings, sauces or dips. Medium Tofu is a it rougher and denser in texture than soft but still delicate. It’s best used in recipes like soups. Firm tofu is just that, a bit firmer than medium and is a good choice in simmered dishes and scrambles. Extra Firm Tofu holds its shape and is good for pan-frying, stir-frying and deep frying. You can also bake or grill and crumble to use like as ground meat substitute. Super Firm Tofu is super dense and has the least amount of moisture, best used for grilling, however, will dry out if cooked too long or at too high a heat. Silken Tofu has the highest water content and had a smooth, silky, custard feel. It has three different textures, soft, firm and extra firm. Silken is the best in desserts, smoothies or any recipe where a smooth finish is desired. The first time I used tofu I was unaware of the many kinds and I used a soft tofu for a scramble and it was a big, sloppy, soggy mess. The whole thing went into the trash and it was years before I gave it a second try. When I did I was much wiser so I picked the right texture. Extra firm was used for this recipe. I’m not a big tofu eater, I generally eat it 2 maybe 3 times a month, however, it has been a couple of months since I’ve used it in a recipe. 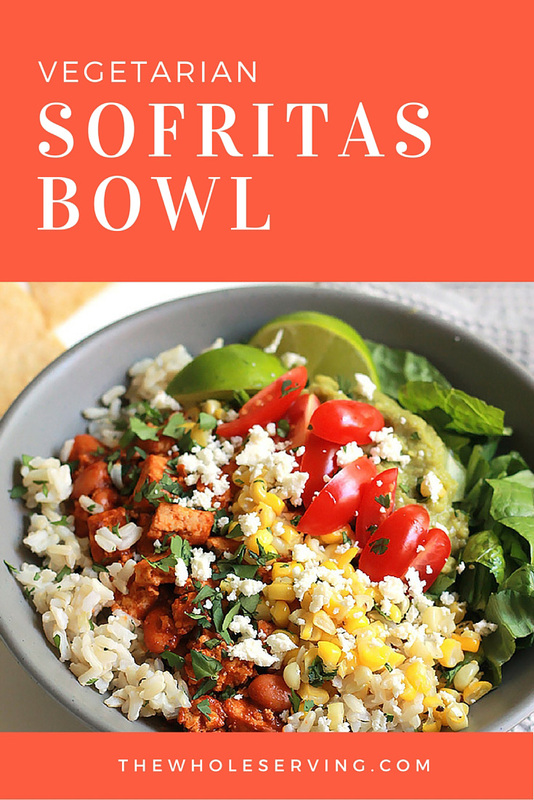 I had a craving for a Chipotle Sofritas Bowl but when I walked into Chipotle the line was just too long for me to wait, it seems it is always busy when I go there. Trader Joe’s is in the same shopping center so I decided to go there get what I needed and just make it at home. It was awesome, my daughter Taylor who never ever wants to try my tofu dishes and who thinks Chipotle is overrated, loved it, she went back for seconds. 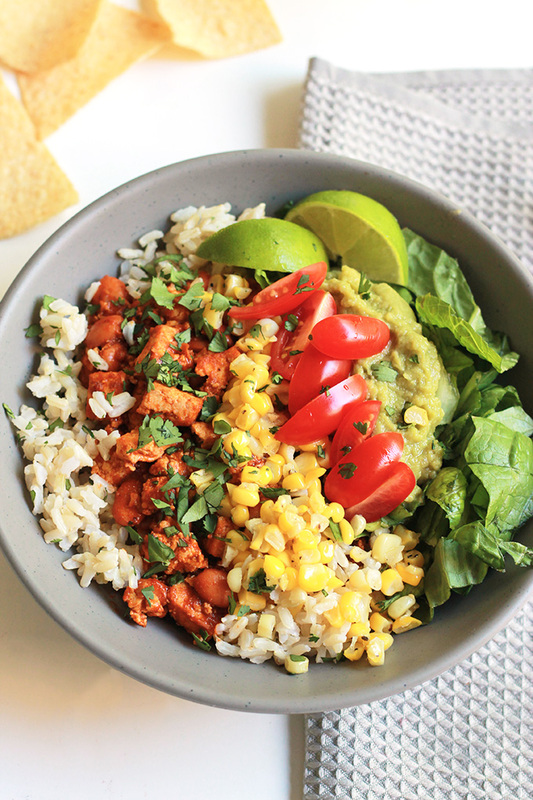 I always get my bowls with brown rice at Chipotle so it was brown rice for the at home version. Because the brown rice takes the longest to cook, I prepared it first, it can also be prepared a day ahead. 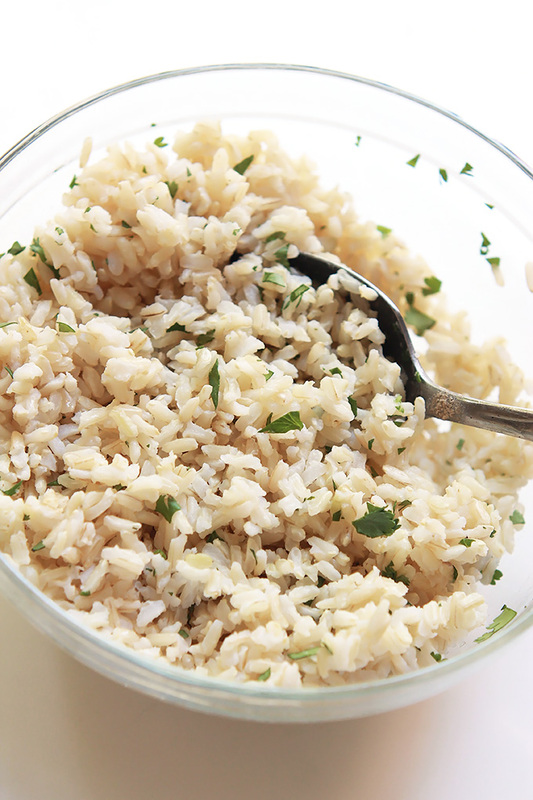 My brown rice was seasoned with lime juice and cilantro, yumo! I pressed the tofu 15 to 20 minutes before cooking to remove as much water as I could, making it a bit firmer. 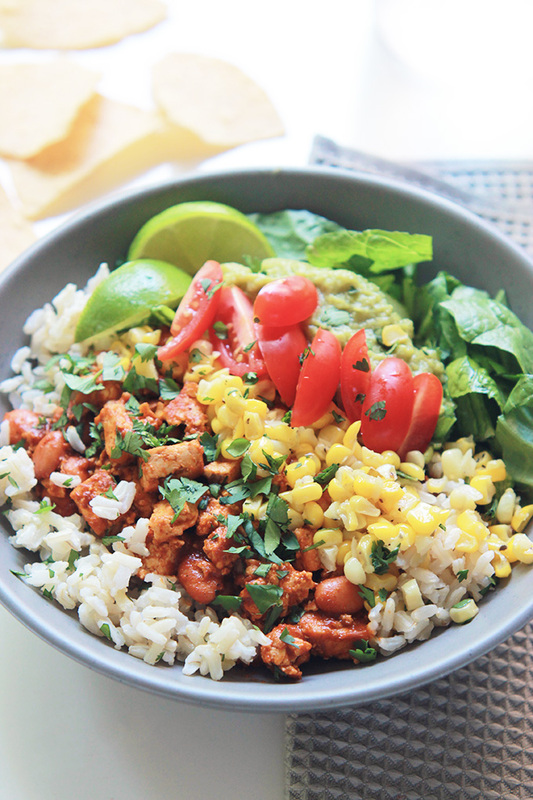 While the tofu is being pressed I cook the corn, chop the tomatoes, cilantro and make the guac. This was so delicious. I ate the vegan version and Taylor had the vegetarian version sprinkled with some crumbled queso fresco. The leftovers the next day were just as good if not better. If you are more of a burrito eater, simply wrap all of this goodness into a tortilla and have yourself a big fat delicious burrito or taco. Open and drain water from tofu, place tofu between two clean kitchen towels on a plate. Place a heavy pot on top and allow to press 15 to 20 minutes. While tofu is pressing wash corn and cut from the cob using a sharp knife. Heat skillet over medium heat, add oil and corn to pan, sauté, stirring occasionally, 6 to 8 minutes. Remove from pan, cover and set aside. 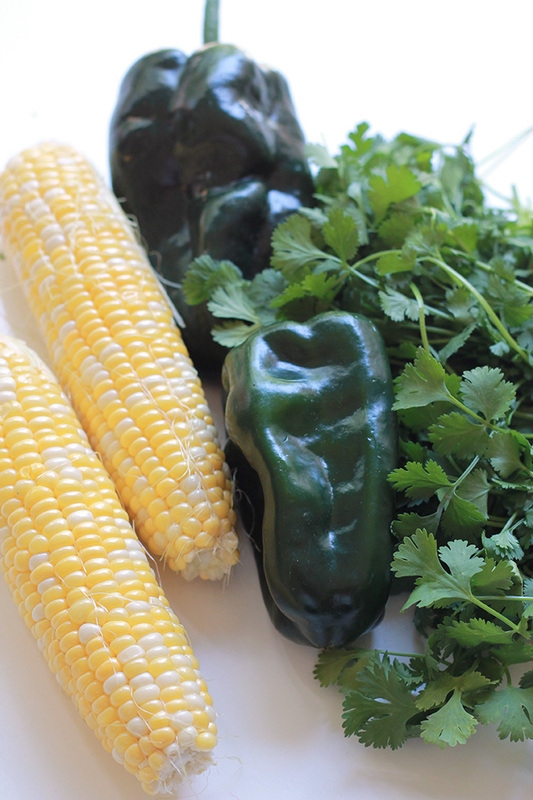 Roast your poblano pepper over the flame of a gas range or in your oven using the broiler until soft and blistered. Remove stem from pepper and place in blender along with chipotle peppers in the adobo sauce, tomato sauce, garlic, cumin, coriander and smoked paprika. Blend until smooth and thick. 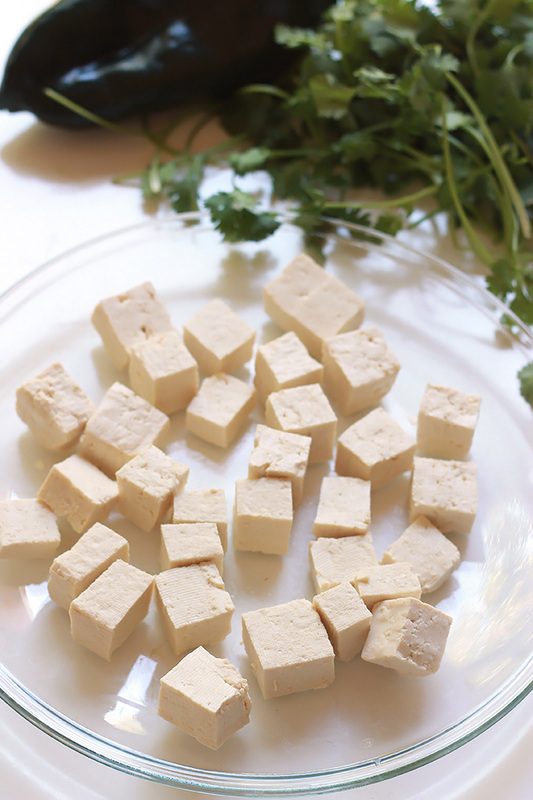 Cut pressed tofu into cubes. Heat oil in a large skillet over medium heat, add diced tofu to pan, stir-fry until it starts to get golden and crispy. With the back of a wooden spoon or spatula break the tofu into crumbles. Add half of the sauce to the tofu and continue to stir adding more sauce until all of the tofu is covered. 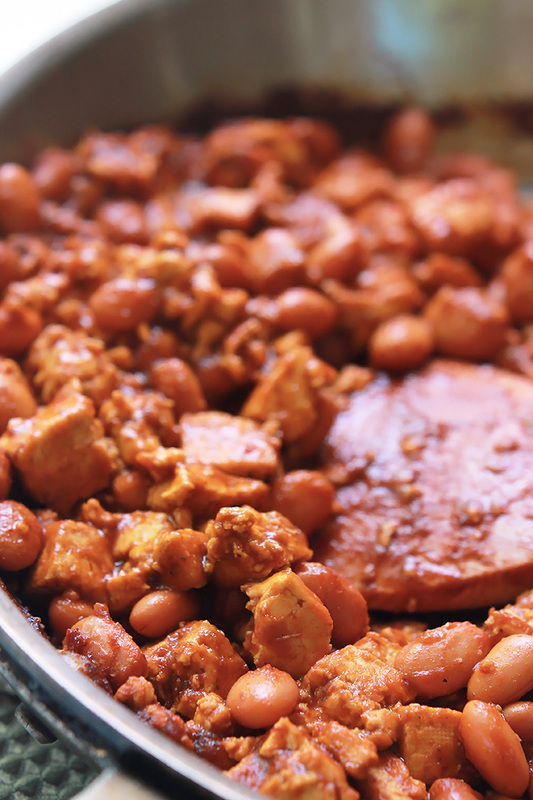 Add the beans to the pan, stir to combine. Add in more sauce until everything is well covered but not too saucy. Allow to cook another 3 to 4 minutes. Depending on how saucy you like it you may have some sauce leftover, transfer to an airtight container and store in your fridge. 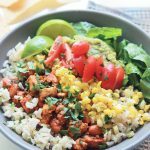 While the sauce is simmering slice the tomatoes, chop the lettuce and make the guacamole, simply cut, pit and scoop avocado, place in a bowl and mash with the back of a fork, stir in juice of one lime, some cilantro and season with sea salt to taste. 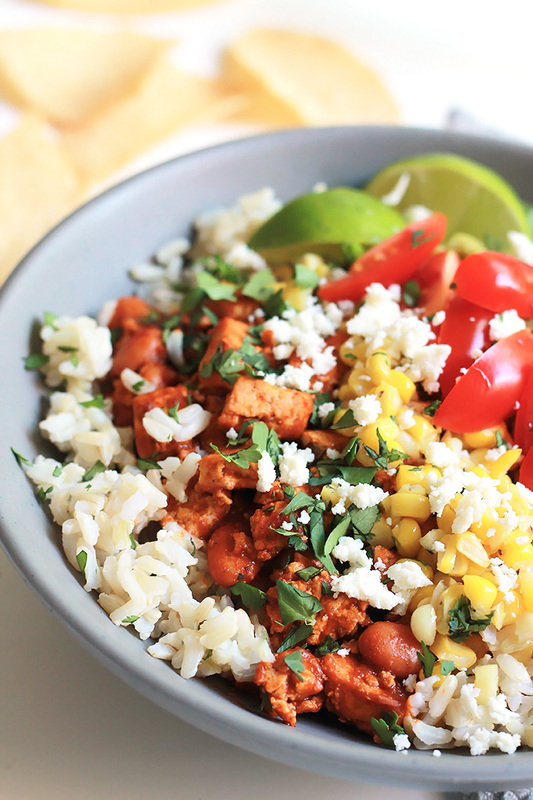 Assemble the bowls, layer rice, sofritas mixture, corn, lettuce, tomatoes, quacamole and crumble cheese if you’re making it vegetarian. If you make this recipe or a version of it, take a picture and share with me on Instagram, tag it #thewholeserving or leave a comment below. 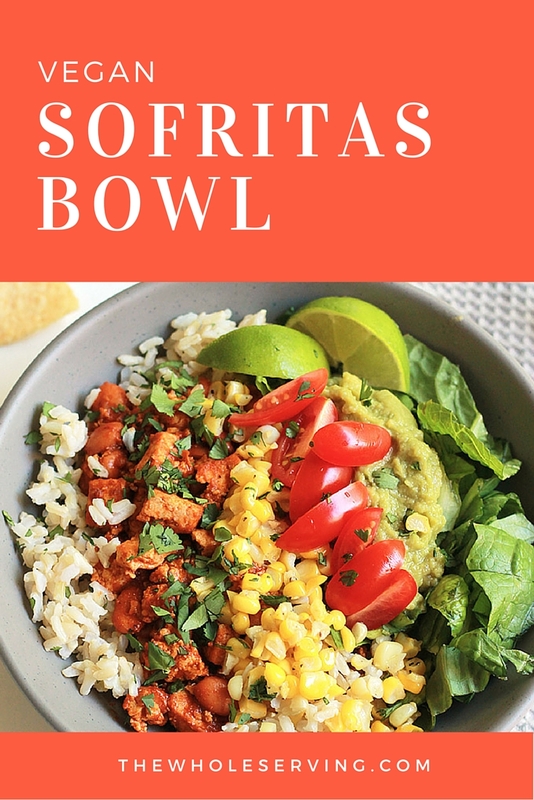 I’d love to see or hear about your version of this Sofritas Bowl-Vegan or Vegetarian. That looks quite yummy and quite healthy too. I haven’t cooked with tofu before but I do order meals with it in restaurants sometimes. Thanks Julie, I hope you give this a try soon. Let me know how you like it. This looks amazing! I have a few go to recipes that have tofu and it is delicious. I love that this has such healthy ingredients! Thanks Sherry, It is also very filling and it makes great nachos. Yum, this is my kind of meal. It looks delicious!! Pinning to give this a try later! Thanks for visiting AJ and I hope you have a chance to give this a try soon. Enjoy. Now this is a full meal. It has all of the food groups and it looks gorgeous. I could definitely see whipping up one of these great dishes. I always make enough to have leftovers, I was pleasantly surprised when my non-tofu eating daughter wanted leftovers the next day. Looks delish! Can’t believe that’s tofu. I’ll have to try it sometime when my husband is outside and doesn’t know what I’m making until it’s done. I bet he’ll like it if I don’t tell him what it is! That’s what I did with my daughter, she ate it and wanted it again the next day. She usually turns down any dish that I make with tofu. I hope he likes it. 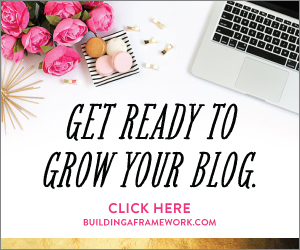 I love your recipe and the fact that your post is so informative, I am one of those people who don’t cook with tofu enough, that may change thanks to your post! Monika I’m glad that you found my post informative and I hope you have success when cooking with tofu. Although I’m not a vegetarian I have been eating more vegetarian meals lately. It’s easier for me to digest, and since I’m already making a vegetarian meal for Georgia it’s just easier for me to eat the same thing. I always make sure that Bruce has his meat, he is definitely a meat and potatoes kind of guy. He will do salads but I have to make sure that there is protein of some kind. I hate to say it, and I wish that it was different, but we are not a tofu family. Even when we’ve tried it in a restaurant that has a good reputation for their tofu, it just isn’t for us. 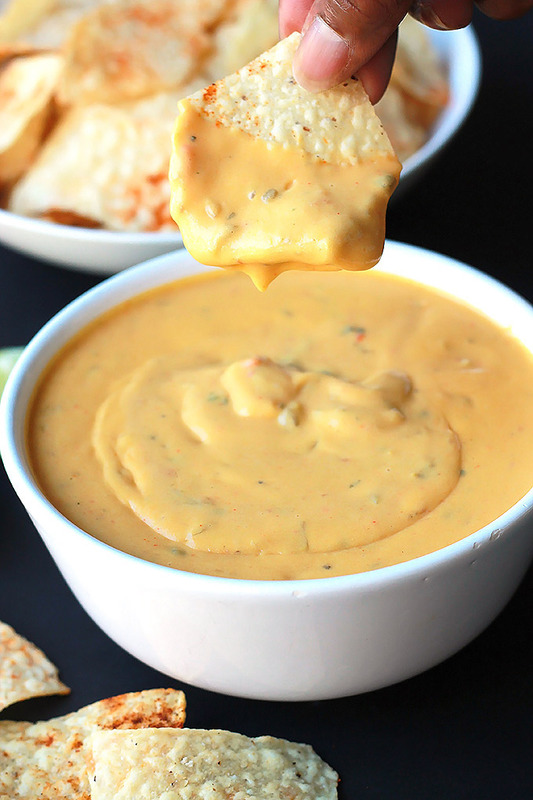 I would rather just have some really yummy roasted or grilled vegetables and a little fresh queso cheese wouldn’t hurt either! Love your honesty, some people are just not tofu eaters. 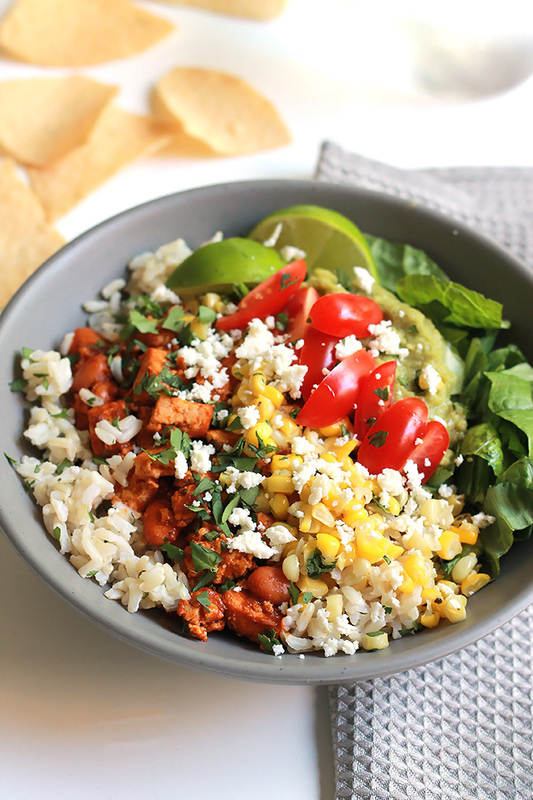 What’s nice about this recipe is that you can totally trade the tofu for chicken or another protein of your choice. Hi Val, I hope you have a chance to give this a try soon. Enjoy! Love those vibrant colors! This looks like a perfect lunch for my busy days at the office! Eva, you are so right, this makes a wonderful lunch, I enjoyed it the next day for lunch and dinner. I wonder if I snuck in some tofu if my family would notice. This recipe looks so good really want to try it out on them. I was very surprised when my daughter ate it and ask for more. This looks so delicious! I’m not much of a tofu eater, but I would totally eat it in this dish 🙂 Thanks for linking up with Merry Monday this week! Thanks Emily, I hope you have a chance to try and when you do I hope you like it.